Day 9: At first we were just shopping in Shinjuku at Closet Child.There, I've bought my dress Moitie Moi Meme and CD of Malice Mizer, Hakuei and SID. 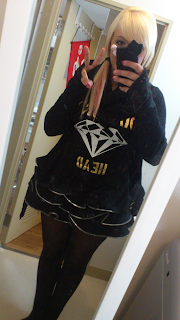 Im so happy, I finally have a dress from my idol "Mana". first appeared MEJIBRAY, actually I have not heard the music often, but live they have pleased me well. I liked Koichi on bass, he had a very great style and he playes good. I could talk more about diaura, but you just have to experience live beautifully. So I can only recommend you sometimes go on a concert of DIAURA and MEJIBRAY. actually we wanted to wait for conny, but we were always sent away by a security. But conny was then busy anyway, but I was having very very very very glad they met there. after that day I was really hungry and glad to be back in Otsuka. since we did not came to eat.